Where are you when you get your best ideas? I will bet you one-hundred dollars that you don’t get your best ideas at work. Most people in my seminars and classes tell me that they get their best ideas while driving a car, exercising, taking a bath or shower, or as they fall asleep at night. While at work, most of us are in the implementation mode, the action mode, the make-it-happen mode. When we get away from work and are able to pay attention to something in a relaxed way, new ideas begin to surface. Activities like driving, bathing, or falling asleep are so automatic that we relax the judgmental part of our thinking, thus allowing new ideas to surface. I’ve often had the experience of waking up in the middle of the night with an idea for a project I am working on. As a matter of fact, my first book, “Why Didn’t I Think of That?” came to me at about three o’clock in the morning in Washington D.C. in 1986. I was finishing up my doctoral dissertation and took the weekend off to visit some friends in D.C. I still remember the meal we had that evening. We had Thai food with white wine. About three o’clock in the morning I woke up with the ideas and the plot line for the book. I grabbed my pocket tape recorder and dictated almost the entire book on to the tape. The next morning, we had to go out and get another tape because I had filled up most of the tape that was in the recorder. Now, here is the kicker. I went to D.C. to get away from all the work I was doing on my doctorate. I almost did not take the recorder with me because I thought I was mentally exhausted. However, if I would have left the recorder at home, I am sure that book would not exist today. Recently, I had the pleasure of moderating a panel of entrepreneurs for one of my clients. All of the entrepreneurs made the point that their best ideas don’t come to them at work. All of them had their best ideas when they were “off the grid.” One entrepreneur goes to his cottage in the New York finger lakes region, another goes to his property in Arizona, another works cattle on a friend’s ranch outside of the city (OK confession- I’m the guy going to the cattle ranch) several of them keep their phones near their beds to that when they wake up in the middle of the night with an idea they can quickly dictate it into a voice memo. 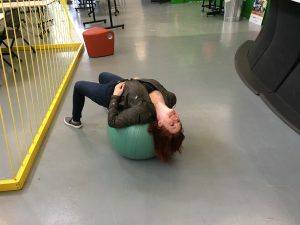 One of the panel members, my friend Michelle Miller-Levitt who owns Buffalo New York’s first podcast studio, Too Much Neon gave one of the most unusual places I have heard people use to come up with ideas. 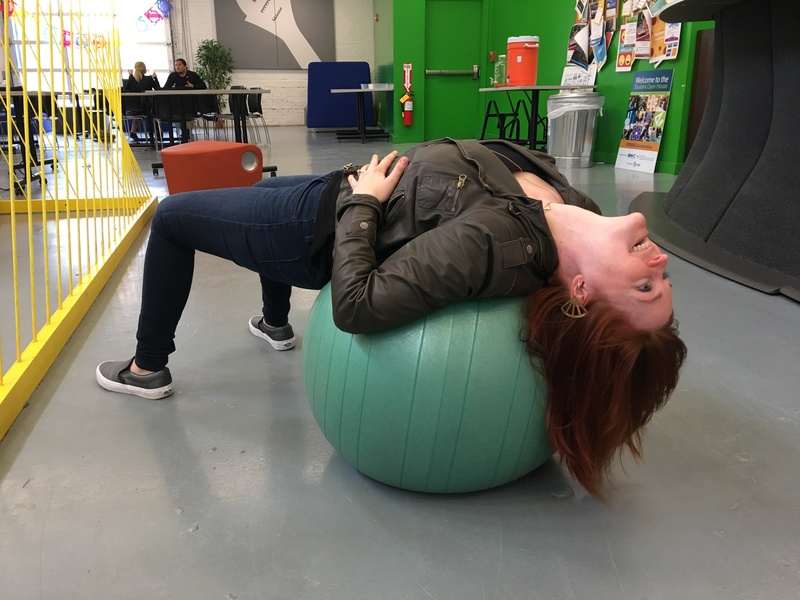 When Michelle is stuck on a problem and is having trouble coming up with a solution, she hangs upside down on a medicine ball. She says that by doing this she sees the world just a little differently. After a few minutes, she has cleared her mind and a new idea usually surfaces. The key is to be ready to catch those ideas when they appear. Keep a piece of paper, a note pad, or your smart phone with you to record these new insights. Actually, I could use a few ideas now for a project I have in mind. I think I will track down Michelle and see if I can borrow her medicine ball. ~ Roger L. Firestien, Ph.D.
A question before you go. Please leave your answer in the comments below. Where are you when you get your best ideas? Don’t worry, we won’t laugh!